The story of a disgraced Communist party official who makes a new life with a community of boat people has won the Man Asian Literary Prize. 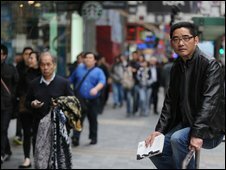 Su Tong was awarded £10,000 at a ceremony in Hong Kong for his novel The Boat Redemption. The author is best known for his novel Wives and Concubines, the basis of the 1991 film Raise the Red Lantern. The three writers on the jury, which included Ireland's Colm Toibin, said the winning book had "immense charm." Chinese-American author Gish Jen and India's Pankaj Mishra were also on the judging panel. "It is also a political fable with an edge which is both comic and tragic," the judges said. Su told Reuters the prize was important to him because he was "not famous for winning prizes". "I'm more famous for not winning prizes," he said. The other shortlisted novels were Jimmy the Terrorist by Omair Ahmad, The Descartes Highlands by Siddharth Chowdhury, Residue by Nitasha Kaul and Eric Gamalinda's Day Scholar. The Man Asian Literary Prize is awarded annually to an Asian novel that has not yet been published in English. It was established in 2007.